Tennessee’s frantic search to find a new coach is over, and the Volunteers are turning to Louisiana Tech’s Derek Dooley. Louisiana Tech spokesman Malcolm Butler says Dooley has resigned from his positions as coach and athletic director to join the Volunteers. A statement by the university was expected later Friday. Tennessee plans to introduce Dooley at a press conference on campus Friday night. 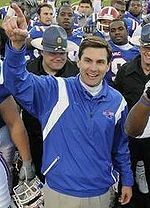 The son of former Georgia coach Vince Dooley, Derek Dooley went 17-20 in three seasons at Louisiana Tech and was the only coach in Division I to also serve as his school’s athletic director. Derek Dooley is also the nephew of Bill Dooley, who coached for over a quarter of a century at North Carolina, Virginia Tech, and Wake Forest. Tennessee must be banking on the coaching genes of Dooley’s father and uncle finally coming to the surface in him. At this point in his career, this second generation hasn’t been too impressive as a head coach. His record at LA Tech was just 17-20. Tennessee has certainly made an interesting selection here.